Notice - Recent South Lake Tahoe elections are now limiting vacation rentals to a maximum occupancy of 12. Our home is within Tahoe Meadows, a Homeowners Association on the shores of Lake Tahoe; our 3200 foot home away from home. Our home is steps to the home owners beach and has a filtered view of the lake. 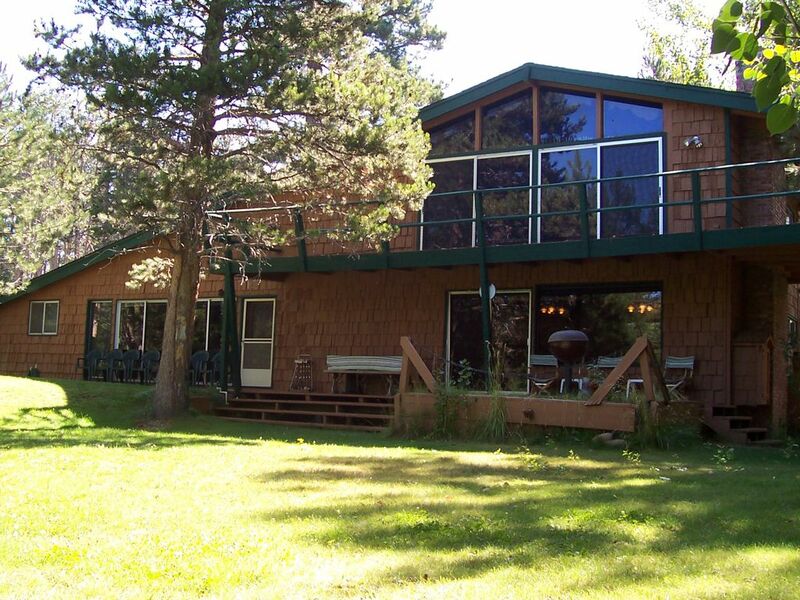 There is Association access to the lake in three places, one very close to our property. Tahoe Meadows is a private gated community where kids can play freely in 100 acres with 96 private residences. It has three quarters of a mile of beach with two piers. There is an enclosed swim area, volley ball court, and ping pong tables at Main Beach. There is off street parking for 8 cars. We are close to Heavenly Valley skiing and the South Shore Casinos. If you want a large roomy house that sleeps 12 fully furnished with a personal touch, plus a convenient location, please consider our home. We love it and we are sure you will too. We vacationed in So Lake Tahoe prior to our marriage in 1982. Then in July 1990 we rented this cabin. At that time we decided to purchase it. By the next August it belonged to us. It is a great gathering place for our blended family of 5 children, 5 in-law children, 10 grandchildren and 1 in-law grand child. Now we live in Sun City Roseville which is close enough that we can go to our cabin often. We love the size of the cabin, and the location in the City of So. Lake Tahoe and within Tahoe Meadows HOA. Cabin has large front yard for sitting and game playing. Inside, visitors can enjoy the 65 inch TV, pool table, wet bar, juke box, large dining room table seating 14+. Wooded lake view! Built for a crowd. 65" HDTV, plus flat screen TV's in two additional bedrooms. Lake view decks on both floors. We loved staying here, the place had some character and was priced great. Plenty of beds and bathrooms for everyone. Close to Heavenly and downtown. Beautiful views. Would definitely stay here again! Great location and very nice house. We had everything we needed! Perfect for a big group and great location! We stayed here with a large group of 15. There were plenty of rooms and bathrooms, which is huge with a large group. But the kitchen, with 2 fridges, two sinks, 2 dishwashers, and fully stocked with everything you could possibly need was the awesome! The HUGE dining table that seated our group was fantastic for talking, visiting, eating and playing games. The location of the home is absolutely perfect! We walked to the private HOA beach(es) within minutes. And the private access throught hte walking path/gate was really cool. We were close enough to walk to restaurants and the brewery as well as the casinos. The uber/lyft was extremely low due to the close location as well. Our whole stay was perfect! I would love to come back to this home for a family reunion or get another future get together. Great house for a large group. Lots of space so didn’t feel packed in. Had a phenomenal weekend staying in the Mt. Joy Lodge! Susan is very responsive and helpful before and during the stay. Can handle a large group and is in a great location, and the house has everything you need and then some, you will not be disappointed. Thank you Susan!! We had a large family group for a long weekend. What a great place to stay. Ample room for 17 people. Always a quite spot to hideout when you needed it. Great kitchen with 2 refrigerators, 2 sinks and a huge table. Tons of blankets, towels, firewood and parking. We still had plenty to do despite no snow. (It is snowing now...boohoo!) We loved our stay, and hope to return next year....maybe even try a summer trip as the location is walking distance to a private beach. You won't be disappointed staying here any time of year. Home owners Association has beach and a recreational supervisor in the summer. Casinos less than a mile away. Has a piano and juke box.